Watch on your TV, computer, tablet or phone. Workout when you want, where you want! I love The Gymbox - Great job! Keep up the good work - you've saved me a lot of time traveling to and from the gym . Since The Gymbox is readily available on my schedule, it has allowed me to stay in a workout routine. With the variety of workouts, I never get bored. I have never worked out as much, or as hard as I have since I've had the Gymbox. And having two little ones at home makes it hard to schedule workouts, but I do it every day now. And last night I hit 60 pounds lost!! I have rheumatoid arthritis. The variety of levels and types of classes on the Gymbox has helped me get into the best shape of my life, safely and efficiently, despite my illness. I owe so much to the wonderful people and instructors there. Thank you, thank you! Going to the gym can be a pain. Dragging the kids to the daycare. Trying to make that 8:00 class on time. Overcrowded sessions. High cost monthly membership. The list is endless. Workout DVDs aren't much better. How many times can you really expect to repeat a workout before the boredom is overwhelming? TheGymbox is a whole new way to exercise. 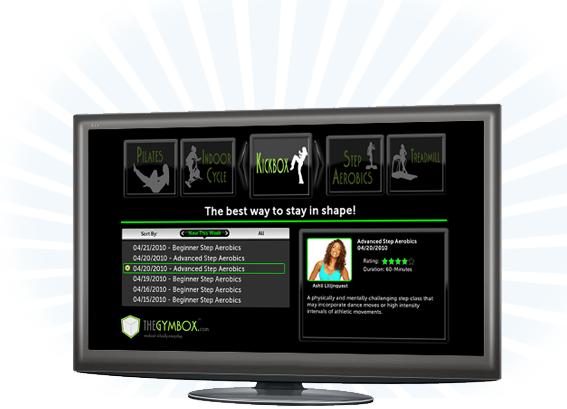 By leveraging the power of the internet, you can have the variety and excitement of gym-style workouts available anytime on your computer, TV, tablet or phone. Imagine, no more hassle and no more boredom. Thousands of workouts ready when you are for about 30 cents per day!